That's all I've got tonight. First the mosquito. I'm not even sure if that's what these bites are. Although, if I leave the doors open at night I find they love to come in here. I've also seen little spiders in my bed - very tiny ones. 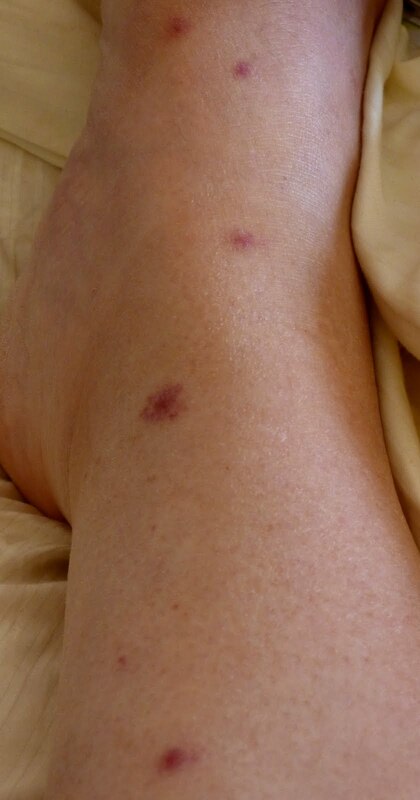 I'm wondering if these are spider bites. They don't itch. It's almost like I'm a little alergic, which I know I am to spider bites. On the other hand, mosquito bites could affect me differently here. The fountain has taken another leap forward. The two curved channels are where the water will tumble from down into the main pool. There will be half dishes there. So, that's it for today. Too tired to tell you anything else. Night, Night.